A Democrat senator suggested that if President Donald Trump withdraws Brett Kavanaugh’s nomination, Democrats could hold the Supreme Court seat open until after the 2020 election. “The world does not come to an end because we don’t [approve] all of the nominees,” Sen. Mazie Hirono said on Politico’s “Off Message” podcast last week, when asked about a political “gridlock” causing a delay until 2020. 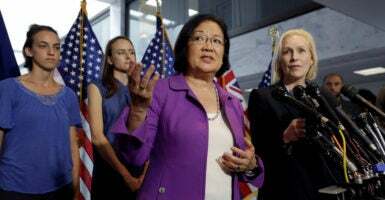 Hirono’s comments come in the same week as an accusation of sexual misconduct levelled at the Supreme Court nominee by Christine Blasey Ford, a California professor of psychology in Palo Alto. Ford alleges, per The Washington Post, that at a house party in the 1980s, Kavanaugh forced himself on her and tried to remove her clothes. She has agreed to testify to the Senate Judiciary Committee this Thursday. The Daily Signal is the multimedia news arm of The Heritage Foundation. “My hope is that if Kavanaugh does not get confirmed there will be much more of a meeting of the minds and that we’ll be able to get back to an advice and consent process,” she added.